This month, we were fortunate enough to visit the beautiful Grampians National Park and chat with Deakin researcher, John White. John has worked on the ecology of the Grampians for around a decade, and his team's research has yielded surprising insights into the influence of climate on small mammal populations. Oddly similar to the boom and bust ecology found in arid ecosystems, the small mammals of our Grampians appear to be highly responsive to rainfall. During dry periods populations are low but they soon explode following high rainfall events. While this is interesting from a scientific perspective, it raises questions about the longevity of our small mammal populations in the Grampians. As our climate shifts and dry periods become more frequent and more enduring, the isolated populations 3-4 hours West of Melbourne may struggle to hang on. Adding to their struggle is the increasing risk of large, intense fires. Such disturbance events may outright kill our furry friends, or deprive them of the food or cover necessary for them to survive at high numbers. However, as John's PhD student Sussie is finding, there are some areas within the Grampians' vast expanses that tend to be less prone to burning and retain moisture during dryer periods. These wetter refuges offer our small mammals a heightened chance at survival and may be the key to conserving these species in this ruggedly beautiful but precarious landscape. Wild Melbourne's Chris McCormack speaks with John White and his PhD student, Susannah Hale of Deakin University about their ecological research in the Grampians National Park. John's team are finding fascinating responses of small mammals to fire and climate in this amazing Victorian landscape. 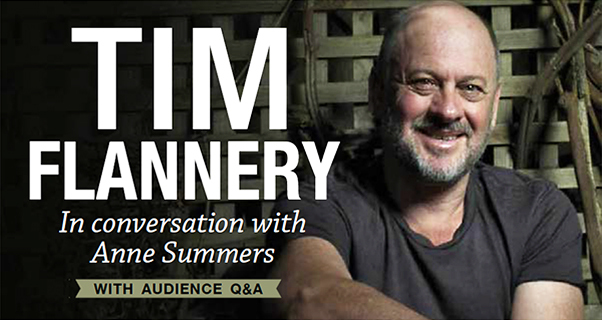 Professor Tim Flannery never planned to become a scientist. Discovering ‘more new species than Charles Darwin,’ was never a major life goal, nor was becoming one of Australia’s most important proponents of climate change action. Instead he was to become an English teacher, while spending his weekends searching for fossils at Black Rock beach in Melbourne. However, this was not to be. Tim Flannery has become one of Australia’s most successful and influential scientists, while also communicating his love of natural history through both novels and television. As such, Flannery has the ability to demand quite the audience at any speaking engagement. Monday night’s conversation with renowned journalist, Anne Summers, was no different. However, it’s Flannery’s latest, and perhaps most significant achievement that brought such a crowd to the Melbourne Town Hall. For many years now, Professor Flannery has been a strong advocate of climate change action, as both a scientist and head of the Climate Commission. Now, after the Abbott Government brought down the Climate Commission in one fell swoop, Flannery has gone on to bigger and better things in heading up the Climate Council. The importance of Flannery’s burgeoning interest in climate science cannot be understated, as it instigated somewhat of a watershed moment in Australia. He has since written an outstanding book on the subject (The Weather Makers) and raised considerable awareness both at home and abroad, despite some strong opposition. Remarkably, Flannery has even faced death threats for communicating the clear, factual science of climate change. When asked if he was scared of the perceived threats, he said ‘No, I don’t usually get scared by that sort of thing, but I get dismayed.’ This proved a poignant moment in the night, with Flannery clearly still saddened by the strong rejection of the science he is trying to communicate. The angry summer of 2012 / 2013. Professor Flannery and the Climate Council predict things will be worse if no action is take. Photo: Climate Council. Despite the apparent dire situation, Flannery remains hopeful; ‘I do have a deep faith in human nature, I do have a deep faith that we’ll deal with this issue when we understand what’s at stake.’ Throughout the 90 minutes for which Flannery was on stage, this was the point to which he kept returning to and reinforcing – the need for education and understanding of the issue. It’s a notion that’s unfortunately lacking across a number of issues in which ignorance breeds resistance. Importantly, an event such as this highlights how vital scientists like Tim Flannery truly are. Not only are they fantastic researchers, but also they’re wonderful and engaging communicators prepared to speak out on important issues. Mention must also be made also of Anne Summers, who proved to be an excellent interviewer, never rushing Flannery through his anecdotes or answers to her questions. Those in attendance have been given one powerful thing tonight – hope. The fact that Flannery remains confident that climate change can be curtailed serves as sound advice for us all to not give up just yet.